The Toolkit is a comprehensive guide to planning and implementing participatory video activities in conflict-affected settings, with a focus on gender-based violence prevention and response, harmful practices, HIV/AIDS, and related health issues. The Toolkit includes a manual titled "A Practical Guide to Community Video Training" that provides detailed session descriptions, exercises, and support materials for a two-week training workshop integrating thematic content with video production, team-building, and interpersonal communication skills. 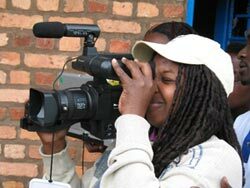 This resource is designed for communication personnel, program managers, and humanitarian agency and NGO staff who wish to strengthen health and social development programs through participatory video. It can also serve as a resource for health advocates, media activists, social researchers, students, and others seeking in-depth information on participatory communication and community-based social change. This desk review, developed under the "Through Our Eyes" project, profiles outstanding participatory initiatives and includes an extensive informational table on relevant communication programs worldwide. If you seek additional information about C4C projects, participatory communication techniques, and related issues, please read the following documents. The Rockefeller Foundation report Making Waves: Stories of Participatory Communication for Social Change (2001) contains profiles of three C4C projects, along with case studies of many other community-based media initiatives around the world. Making Waves is available free of charge from the Rockefeller Foundation in either English or French language versions.